Innovation and paywalls were the buzzwords at the 20th World Editors Forum (WEF) and the 65th World Newspaper Congress, held recently in Bangkok, Thailand. There was hardly any panel which didn’t address the ostensible merits of establishing a paywall, or how innovation – proposed and perceived mostly as mobile app development, responsive web design or changes in the newsroom culture to embrace new media and mobile first strategies – had changed the fortunes of media companies. In my own submission at WEF, I flagged the innovations pioneered under Groundviews in using web based platforms and services to highlight stories otherwise marginal, or untold. Whereas WEF was agog with the potential profit making potential of paywalls, innovations through Groundviews focussed on content that would not otherwise be known to a wider audience, or recorded for posterity. Groundviews doesn’t have a multi-million dollar budget, any newsroom staff or a graphics department and yet launched an iPhone app to access site content, Twitter feeds and report from the field as far back as 2011. Optimised for the then freshly introduced Retina display on the iPhone 4, the app was the first of its kind in South Asia for a citizen journalism initiative. While the innovations paraded at WEF by some of the world’s largest and best known media companies and news organisations where mostly rants about how one needed to embrace the mobile web or else face rapid obsolescence, Groundviews offered a different, and I hope, more compelling story – a meta-story if you will, about how it captures, archives and visualises content often no other media institution in Sri Lanka can or will feature. I spoke about the use of Google Earth in the visualisation of the bloody end of the war in Sri Lanka, as well as in the fate of mass graves in the North and East of the country. I flagged how the site archives tweets around significant events and processes in Sri Lanka. Data visualisation and open data journalism are alien concepts in Sri Lanka, and yet this is precisely what – without calling it such – Groundviews is providing examples of, and moreover, how to do it for free or little cost. But beyond the technology, I spoke about how Sri Lanka is NOT a story in the global media today, after the end of the war and more precisely, how the feel good tourism coverage on the country glossed over real violence. Flagging, inter alia, the serious and growing violations of human rights, the systemic breakdown of democratic governance, the rapid rise of Islamophobia, the near total mockery of the Rule of Law and the continuing and the violent marginalisation of the Tamil community, my presentation was in effect how a platform as simple as WordPress could bear witness to that which no one else was recording, interrogating, archiving or investigating. The most valuable innovation for me is not what you do with a multi-million dollar budget. It is what you do, and how you do it, using little or no resources – human or financial. It is how you showcase the best journalism under duress, and a violent content. It is how you report when you know what you focus on will invariably result in serious pushback – physically, virtually or both. It is strategically planning for this pushback. It is leveraging the power and potential of freely accessible web platforms and apps, which may have never been designed with journalism in mind, to capture stories that need to be told. It is the self-education that is necessary to keep subjects and contributors safe, and yet, get their stories produced and published. It is how a simple archive of tweets can be, over the years, the richest source of critiques over promises unkept or broken. It is to embrace arts, theatre, music, photography, dance, painting and data visualisation as forms of journalism and then see how digital media can augment physical production and performance. All this and more, over seven years, Groundviews has pioneered. WEF was a rare honour to participate in and contribute to as well. Yet for me, it was substantively largely passé. Innovation in media blossoms not just with millions of readers subsidising its real cost, or for and in the developed world, but when there is no help, safety net, international media gaze, human resources or financial resources. It’s this innovation that also needs to be flagged, and models to support and sustain, created. Vikalpa (www.vikalpa.org) relaunched its website yesterday, with a renewed focus on compelling and original opinion and analysis in Sinhala from Sri Lanka. First launched in 2007, the old website had become unwieldy, inelegant and hard to navigate. The new website introduces a number of new sections, and makes it easier to follow content updates on Twitter, Facebook, access Vikalpa’s Flickr and YouTube channels and listen to its in-house podcast productions. An enduring challenge beyond the scope of the site, yet central to its reach and accessibility is Sinhala font installation. This of course will gradually and invariably disappear over time, with new versions of Windows for example featuring Sinhala language support out of the box. At present however, journalists and readers outside of Colombo have repeatedly asked Vikalpa for directions on how Sinhala and Tamil fonts can be installed on their PCs. One of the best resources currently in this regard are the Sinhala Bloggers Union guides. Vikalpa’s channel on YouTube has repeatedly entered the global top 100 list. With more than 500 videos watched well over 400,000 times, short-form video content seems to be, perhaps also in the face of the technical challenges of rendering Sinhala on the web, more popular. For example, this one filmed recently in Colombo clearly showing Police protecting the thugs who attacked a peaceful protest in support of Sarath Fonseka was viewed over 9,000 times in a week. I’m working with the Vikalpa team to develop their digital media production and web journalism skills. Is the LTTE really finished and the War over? is a series of short videos in English, Sinhala and Tamil featuring promiment politicians, former LTTE members, academics and civil society activists. The 24 videos in this series have been viewed, just a few days after they were uploaded, well over 37,000 times collectively. Some videos alone have generated over 5,000 views to date. Propelled by interest in its latest video series, Vikalpa Video is at the time of writing on the Top 100 list of YouTube channels globally. For a playlist of all the videos and for updates to the series click here. 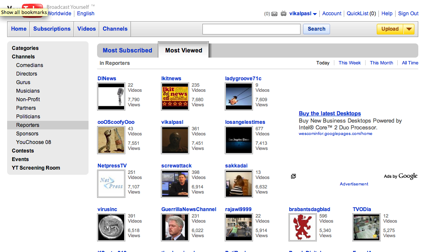 For the 3rd time since its launch, Vikalpa’s YouTube video channel has hit the Top 100 list. At the time of writing, it’s #31, though earlier this morning it was #29, the highest rank globally Vikalpa has attained to date. Earlier this year, Vikalpa was on the Top 100 list for its coverage of Lasantha Wickrematunge’s assasination. Today’s rank was propelled by a video series titled “Is the LTTE really finished and the War Over?“. A video featuring the spokesperson of the Jathika Hela Urumaya (JHU) alone was viewed over 3,400 times in less than 24 hours. The video featuring Prof. Rohan Samarajiva’s response to this question in English was also viewed over 1,600 times in the same time period. Click here for a playlist of the videos, which are in English and Sinhala. Indi and Dinidu are two examples of bloggers who transition easily, and arguably effectively, between new and mainstream print media. Indi’s just taken up a column in the Sunday Leader (as I have, more anon) and Dinidu was formerly with the Daily Mirror, helping them inter alia to set up a Twitter feed. Both write regularly on their blogs, treating blogs not as another chore but an integral part of their self-expression and work. The three of us are perhaps the only bloggers in Sri Lanka that engage regularly with mainstream media (though authors such as David Blacker write the occasional piece). I have an on-going English TV talk show, write to Montage and Spectrum monthly, have just accepted to write a column in the Sunday Leader, blog here, edit and manage Groundviews, occasionally give input into Vikalpa, Vikalpa’s YouTube channel, archive websites at risk of being blocked or just dissapearing and am part of a many other web initiatives that seek to promote progressive, civil dialogue aimed at securing dissent and democracy in a violent context. Background paper to a workshop on Citizen Journalism I’m organising in the near future. Full paper with references as a PDF from here. Many less radical institutions – governments, NGOs, think tanks – are struggling to address the same challenge, unable to respond to the rapidly shifting balance of power between the individual and the institution radically disrupted by the Internet. In today’s ultra-networked world, an unaffiliated individual with a laptop and an Internet connection is often more influential and resourceful than an organization with a staff of twenty and a fax machine was only twenty years ago. The debate over citizen journalism in the U.S. tends to dwell, tediously, on whether citizen reporters can supplant, rather than complement, the professional press. But in many countries around the world, where the press is under government control, corrupt, or simply incompetent, citizen journalists may be the only source of information that is reasonably credible. Without citizen reporters in Myanmar, for instance, it would have been impossible to know what was happening during anti-government demonstrations last year, while in the Middle East, bloggers have become a viable alternative to the heavily censored, state-run media. Citizen journalism on the web and Internet is seen in this short paper as a way through which all peoples of Sri Lanka, with something as basic as ownership of or access to a mobile phone, can hold to account the violence practiced by the Rajapakse regime, the LTTE, the TMVP and other armed groups in the country who policies and practices are inimical to democracy. Put simply, citizen journalism aims to be as much as a annoyance to them as they are to democratic governance. 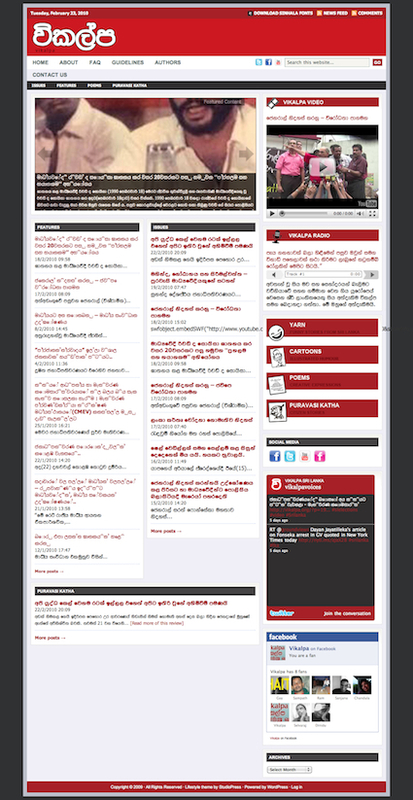 There are well over 300 blogs in English, Sinhala and Tamil now aggregated on www.kottu.org, Sri Lanka’s largest blog aggregation site. There is already a growing culture of vibrant debate on issues linked to governance, human rights, war and peace on the blogosphere that rivals the qualitative reportage in mainstream media (MSM). New voices on blogs like Dinidu de Alwis and Indi Samarajiva are speaking with a new voice, appealing to new audiences and capturing malleable minds of youth more familiar with web media than traditional print and electronic journalism. Read Remote Controllers a threat to National Security.